British luggage name, Antler take their fashion `cred’ to new heights with the recently released Viva collection of hard bags with a distinctive surface. In this collection, hard recessed lines merge with high gloss to form a visually impressive hard case. Twin V’s, like those in the word Viva are behind the product’s name. 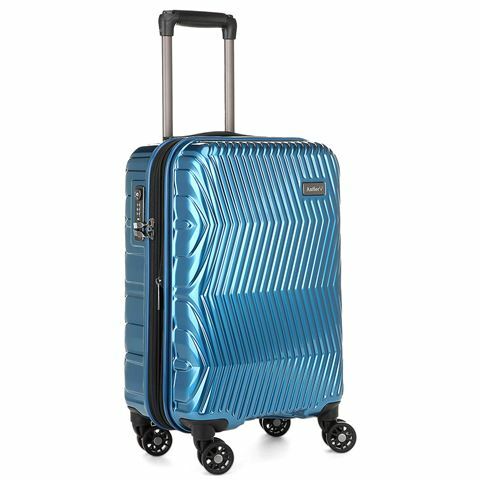 Taking inspiration from futuristic steel framed buildings, Viva is the perfect choice for those who wish to make a style statement with their luggage. Simply dazzling. The deceptively light Viva bags are crafted from a durable 100% Makrolon Polycarbonate shell material, which works in conjunction with the twin V design to add strength and superior impact resistance. They’re also versatile as a twist grip handle enables users to smoothly transition from 4 to 2 wheels, This will also increase the ride height to reduce scuffing. With Antler’s Viva you’re travelling well. Crafted from 100% makrolon polycarbonate. Twin V design adds strength and superior impact resistance. A twist grip handle enables a smooth transition from 4 to 2 wheels, also absorbs shocks of uneven terrain. Lightweight locking trolley handle system. Top and side haul handles for easy lifting. Fully lined interior with packing straps and zippered divider for easier packing. 2 x interior zippered pockets and 1 x zippered mesh pocket. A gun metal recessed TSA-compatible combination lock secures the main compartment. A TSA lock works in exactly the same way as a normal padlock, but when you travel in America, it allows security staff at airports to open your bags should they need to inspect them, without the need to damage your padlock or your bag. External Dimensions: 51.5cm (l) x 80cm (h) x 34.5/37.5cm (w).